When I heard, some time ago, that the British publishing house Profusion intended to dedicate a book to Ion Rimaru, the killer who terrorized Bucharest at the beginning of the ‘70s, I considered it an interesting initiative but I was sceptical about the final result. After all this was about a young publishing house which so far had published three Romanian crime fiction books in translation: Attack in the Library by George Arion, Kill the General by Bogdan Hrib and Anatomical Clues by Oana Stoica-Mujea. Their ambition and passion in promoting Romanian crime fiction were huge. Rimaru seemed to me at that time a simple attempt to boast that Romanians had their own Jack the Ripper. 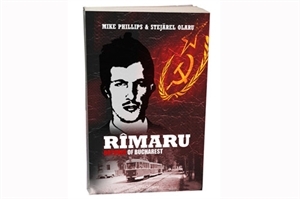 But the fact is that both the crime fiction translations and the true crime book we are reviewing – Rimaru-Butcher of Bucharest by Mike Phillips and Stejarel Olaru – were published without problems and also attracted some interest. The two authors conducted a thorough programme of research and created a an authentic image of the first serial killer from post-War Romania. The tormented historical context in which Rimaru appeared – both physically and as a myth - is also described and explained with plenty of details. The location of each crime committed by Rimaru is described with pinpoint accuracy: the Bucharest of the book be comes alive, and one can recognize it. The reconstructions are made in the style of the Discovery channel documentaries: one can hear not only the voices of the storytellers, but also the confessions of those present at the crime scenes. To repeat: the research process was intense and exhaustive – even the names of the dogs used in the investigations are noted down. And, only by means of a couple of phrases, each witness’ portrait is sketched convincingly. Mike Phillips and Stejarel Olaru didn’t attempt to make a subjective analysis of the Rimaru case, but they gathered a lot of information and declarations and offered them to the readers so they could form their own opinion. The only subjective fragments are the few descriptions of some Bucharest streets, as well as several paragraphs from the Prologue. Admirable also, is the effort of familiarising the English speaking public with certain Romanian expressions, impossible to translate word by word. The footnotes, without being distracting or excessive, help the reader in understanding those expressions. Social analysis is not missing either. One of the authors’ observations drew my attention in particular. In that period, people gave proof of exaggerated individualism and a lack of interest in helping their fellow humans. This issue is revealed in the contradictory declarations by some witnesses to the same crime, and by their failure to react in the moments before or after the crimes were committed. A shocking example is that of Elena Buluci who, after having been attacked by Rimaru, managed to drag herself to a nearby block of flats where she asked for help just only to be refused, in spite of her serious condition. Rimaru – Butcher of Bucharest is an excellently written and an excellently devised book. It is not only a step towards promoting the Romanian crime genre in a broad sense; but it represents (and this in the first place maybe) a valuable historical document, well assembled, a model of how to collect scientific research and present its results in an attractive manner.